Few forms of advertising are as versatile, affordable, and effective as a well-placed vinyl sign. Nowadays, outdoor vinyl signs come in a variety of shapes and sizes. Whether you’re a print shop owner looking to expand your offerings or a small business owner looking to gain a leg up on the competition, vinyl signs may be the solution for you. What are the most common types of vinyl signs? Before the widespread use of printers, a lot of signs were hand-painted. Often, vinyl media was chosen as a canvas for its portability — it’s lightweight, easy to roll, and affordable. Getting a sign hand-painted meant hiring a professional painter to design, lay out, and execute the artwork. Hand-painted vinyl signs are rare these days. While custom hand lettering is becoming popular again for shop windows, vinyl signs are easily made using screens or printers. One reason for their disappearance? Hand-painted vinyl signs aren’t particularly rugged and don’t stand up well to the elements. Screen-printed vinyl signs are more common than hand-painted ones. They operate on a similar principle — applying ink manually to the vinyl to create lettering and graphics. Screens produce high-quality images and text with sharp lines by using stencils to apply layers of color. Screen-printed outdoor banners and signs are usually reserved for instances where a large number of the same banner is needed, making screen printing a cost-effective solution. Large-format printing has made most other forms of vinyl sign production obsolete in all but a few cases. Today’s large-format inkjet printers use durable pigments that are designed to stand up against rain, snow, and sun. These pigments come in a variety of forms, including water-based inks, standard solvent-based inks, eco-solvent, or UV-curable inks. Digital inkjet printers can produce photo-quality prints on vinyl banner material quickly and inexpensively. Most banners and vinyl signs you see today came from a professional grade digital inkjet printer. While all vinyl banners are made from PVC, not all vinyl sign materials are the same. Different printing processes require specific materials to work, and choosing the wrong vinyl can lead to low-quality results. Screen-grade vinyl is designed for use with screen printing apparatuses. It features high dot gain (the size and number of indents on its surface) to ensure that ink fully and evenly covers the material. Screen-grade vinyl is usually lighter in hand and flexible — in part because it’s often made inexpensively overseas. Inkjet-grade vinyl is a more technically sophisticated material with less dot gain to accommodate precision inkjet heads. Inkjet-grade vinyl usually has a stiffer hand, which helps it withstand the rolling and heat that’s involved in printing. High-grade inkjet vinyl media will accept a host of different solvents and inks, making it versatile enough for just about every printer in the shop. Printing screen-grade vinyl on large-format inkjet printers leads to a host of problems, from poor image quality to wrinkling and jamming. In addition, most screen-grade vinyl isn’t curl-free, meaning it’s not designed for rollers and will curl almost immediately out of the printer. The simplest way to display your sign is a hanging banner. Once printed, your banner will be hemmed along the edges for a clean look and affixed with either grommets or pole pockets, depending on your intended use. Hanging banners can be hung on the fronts of buildings, suspended from awnings, or stuck into the ground with poles. 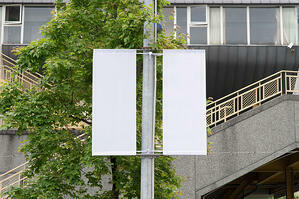 Light post-style banners use two pockets on the top and bottom of the banner to pull it taut between metal rods. This variety of banner is usually printed double-sided, using two pieces of single-sided material or one high-quality double-sided vinyl banner. A newer way of advertising on the go, vehicle wraps use static cling or magnetic adhesive vinyl pieces to wrap a car or truck with a graphic. In many cases, these adhesives are removable. Similar static cling/magnetic adhesive vinyl signs can be used for advertising on shop windows. Printed vinyl banners can be pulled tight over billboard frames to easily produce large outdoor advertisements. Billboard wrapping requires a high-quality vinyl media in order to prevent the ripping, stretching, and wilting that comes with large-scale mounting. Hardback signs use adhesive vinyl stickers placed on rigid substrates to create free-standing signage. This method is popular for political campaigns, lawn advertising, and more. Hardback signs are popular because they require little more than a wire clip or single pole to stand upright. Look around and you’ll notice how many different forms vinyl signs can take in today’s world. A lot of companies gravitate toward vinyl signs as a cost-effective solution for their advertising needs. Knowing what kind of signs are available helps marketers and print shop owners come up with more creative, eye-catching signage. Learn more about digital printing techniques and commonly used ink types by downloading our free whitepaper today!